Kate is thousands of dollars in debt, her husband found out she cheated on him, her career as a screenwriter is failing, and her father has just committed suicide. Now she is being pushed into a miserable few days as she and her older brother and sister return to Atlanta to face the house, multiple ex-wives, and stepchildren their father has left behind. 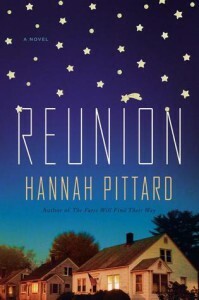 Reunion is a quirky intimate look at family with all of its dysfunction told from the eyes of Kate, an endearing yet at times cringe-worthy narrator. Hannah Pittard has integrated humor and heart as Kate hits her rock bottom, sinks a little further, and tries to figure out her way back up again.